The Open Purchase Orders Reports application enables you to identify items that were ordered and not received into inventory. 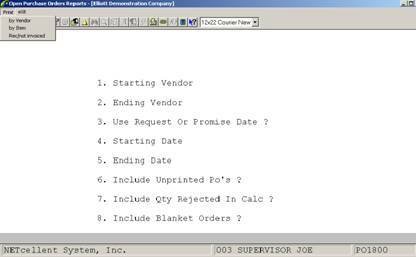 You can select to print the report in vendor or item number order. 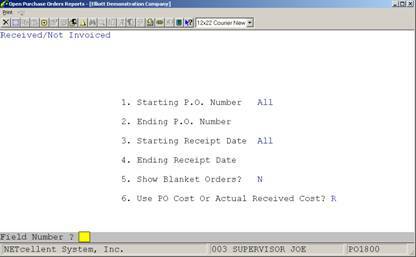 It can display the quantity ordered, dollar value and quantity not received of each item ordered through a specified date. The Received/Not Invoiced report prints items that have been ordered and received, but that you have not yet received an invoice for. It prints the quantity ordered and received of each item as well as the quantity invoiced and dollar value not yet invoiced. * Select the Open Purchase Orders Report By Vendor, the Open Purchase Orders Report By Item, or the Received/Not Invoiced Report from the print pull-down window. Enter the starting vendor number in the range you want to print, or press RETURN to print All vendors. To search by Vendor No. enter F7, or F8 to search by Vendor Description. Enter the ending vendor number in the range you want to print. 3. Use Request Or Promise Date ? 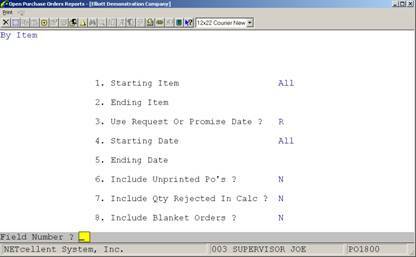 Enter R to select purchase orders by request date or P to select by promise date. Enter the starting date in the range you want to print. Enter the ending date in the range you want to print. 6. Include Unprinted Po's ? Enter Y to include unprinted Po's or N to decline. 7. Include Qty Rejected In Calc ? If you answer Y, the inventory that has been received, but rejected and not placed into inventory will be included in the "Not Received Quantity" and "Not Received Dollar Amount" totals. Otherwise, it will not be used for these totals. Answer Y to include Blanket Orders on the report. Enter the starting item number in the range you want to print, or press RETURN to print All items. To search by Item No. enter F7, or F8 to search by Item Description. Enter the ending item number in the range you want to print. If you answer Y, the inventory that has been received, but rejected and not placed into inventory will be included to the "Not Received Quantity" and "Not Received Dollar Amount" totals. Otherwise, it will not be used for these totals. 6 numeric digits followed by 2 numeric digits (999999-99). Enter the starting purchase order number for the range to be printed. Enter the ending purchase order number for the range to be printed. Defaults to the starting purchase order number. Enter the earliest purchase order entry date for the range to be printed. Only purchase orders entered between this and the ending date will be printed. Enter the latest purchase order entry date for the range to be printed.